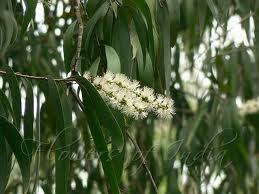 Description - A large tree with pale peeling bark and slender drooping "willow-like" branches. The leaves are thin and pointed. Thin, creamy white flowers appear in spikes in summer and autumn. Indigenous to Indonesia, Papua New Guinea, Northern and Western Australia. Effects on the Body - Herbalists use cajuput internally to treat bronchitis, tuberculosis, colds, sinusitis, gastric infections and roundworms. Externally it is used with great effect for rheumatism, gout, neuralgia, acne, nasal congestion, sinusitis, toothache, chilblains, and skin diseases.